The pontiff is to meet migrants and Muslim leaders, and hold a Mass for the country's small Roman Catholic community this weekend. The Vatican considers the papal visit a continuation of last month's historic trip to the United Arab Emirates. To a crowd of thousands, Pope Francis said it was "essential to oppose fanaticism" and for the faithful to "live as brothers". He defended "freedom of conscience" and "religious freedom" as fundamental for human dignity, and said it was "necessary" to make the "appropriate preparations of future religious guides". 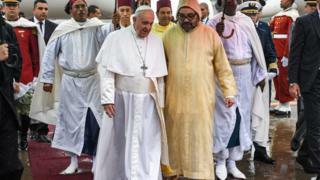 The spiritual leader of the world's 1.3 billion Catholics was invited to the North African nation by its king, Moroccan authorities said, as part of the "development of inter-religious dialogue". But Christians - who make up less than 1% of the country's 33 million people - say they are not allowed to worship openly and face discrimination.